Find the perfect DIY gift for mom this year with one of our favorite homemade Mother's Day gifts. From soaps and salt scrubs to flower arrangements, paper crafts, and wall hangings, this craft collection has it all! We've got ideas for both kids and adults, so everyone can shower their mom with some love this holiday. 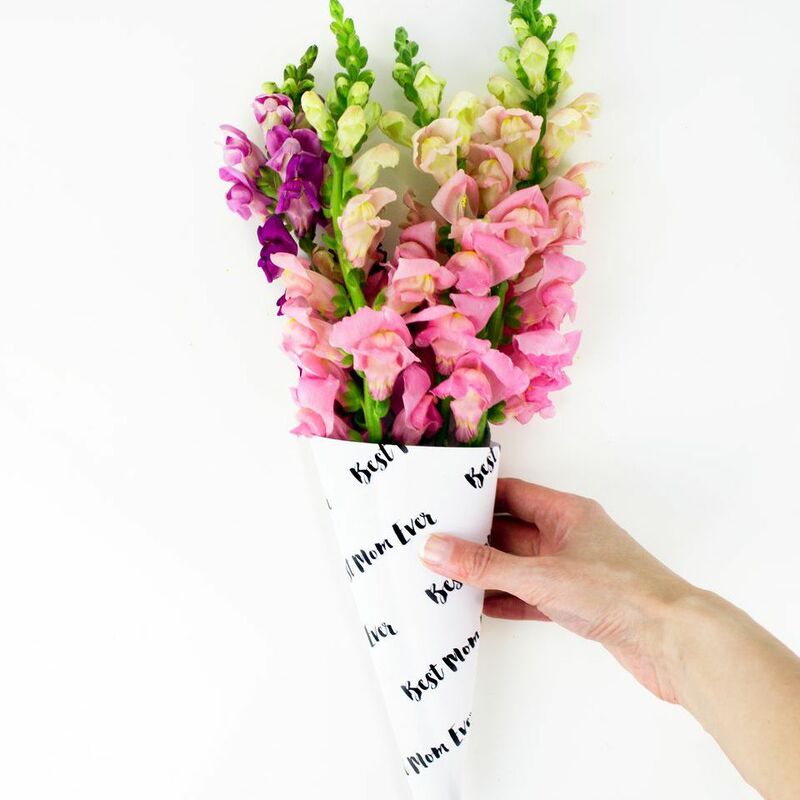 Give mom some sweetly-wrapped fresh blooms with this perfect Mother's Day bouquet paper wrap DIY. This idea is perfect for last-minute gifters (we won't tell!) or anyone who always gift flowers on Mother's Day anyway. Treat your mom like the queen she is with these easy DIY gemstone soaps. They're easy to customize in any color or scent. These sweet DIY flowers won't fade after Mother's Day! Easy to make and a great way to brighten up any space. This sweet smelling soap is so good, Mom won't even know it's homemade! Use this printable to create a sentimental memory jar. Jot down all your favorite family memories or all the reasons you appreciate your mom. This cute craft is perfect for any cooking mama. Footprints and handprints can be transformed into cute butterflies and bees with a little creativity. Give mom the gift of relaxation this year with these easy DIY bath salts in a range of colors and scents! Give some of mom's old planting pots a facelift or provide some new ones with a personal touch! This craft is easy, cute, and will remind mom of her little one's love all year round. This is a creative way to showcase extra school photos, and makes for a perfect Mother's Day gift! These sugar scrub recipes are good enough to eat! Turn Mom's favorite scent into an exfoliating scrub. This is the gift that keeps on giving–an easy and personal coupon bouquet! Offer to clean the kitchen or walk the dog and make your mom's month. 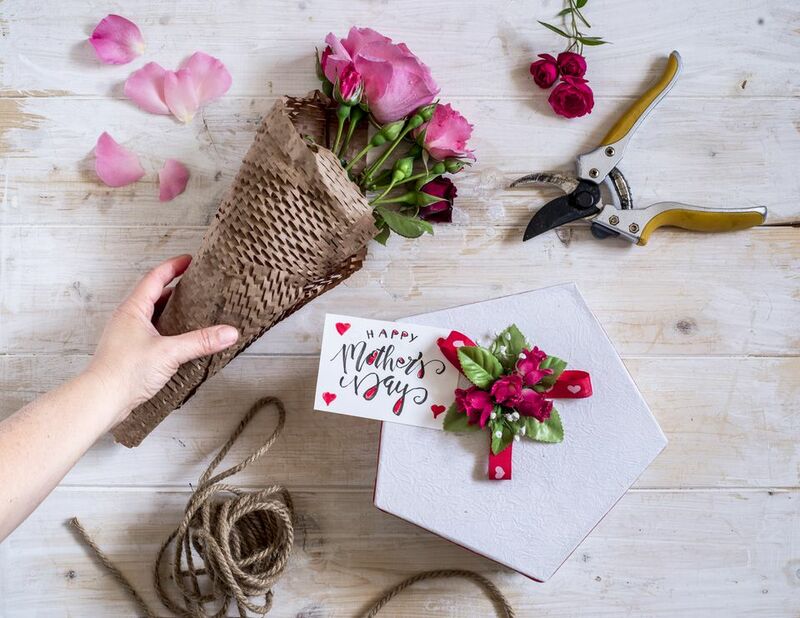 This super creative idea from Hello Splendid includes everything your mom could possibly want for her special day. This easy popsicle stick card is a super cute way for kids to tell Mom how they feel. Get the whole family involved with this craft and remind Mom of how much you all care. A painted tin can is a perfect multi-purpose gift: perfect for flowers, cooking supplies, or just spare change! Tulips are the ultimate spring flower! Give mom this adorable paper tulip arrangement for a bouquet that will last more than a week. A coffee cup candle is an easy and sweet gift that is functional even after all the wax has melted down (so Mom won't feel so guilty burning it all right away!). Bath bombs at trendy soap stores can be so overpriced, so why not make your own? This recipe is easy, customizable, and DIYable! Turn a vintage handkerchief into a sweet home decoration for Mom with this easy embroidery tutorial! This butterfly handprint card is super cute and perfectly personal. Write a sweet note with a cute butterfly and make Mom's day. A spa right at home is a creative, cost-effective way to help mom relax on Mother's Day! Throw in some homemade soap and you've got a winning gift. Remind mom of what really matters this Mom's Day with a cute photo vase, using only a mason jar and any photo of the kids!